New Eyeglasses. I bought online! My last eyeglasses were driving me crazy. They just didn’t fit well on my face and I was at the shop getting them adjusted almost weekly. So no tears were shed when my husband accidentally stepped on them. Luckily, I still had my old glasses. Like many, I have vision insurance. And like many, I have to wait a certain amount of time before getting new eye wear. So the first thing I thought of was to visit one of the 1 hour eye glass stores. They were advertising a special a hundred bucks or so which seemed like a good deal. I wasn’t surprised when the sales woman told me I would have to pick from a certain very small group of frames. And I wasn’t surprised when she told me there would be an additional cost for my prescription. I WAS surprised when she estimated my glasses would cost $500! Ouch! So I decided to wait until my insurance would cover a new pair which happened just after Christmas.In the mean time several friends had written that they, or their relatives, had ordered glasses online. But would they work right? I put them to the test with Rebecca who was scheduled for an eye exam and wanted to get new contacts. (Our insurance covers glasses or contacts, not both.) Since she has minimal vision problems we decided to order a pair of glasses with her new prescription online. And why not? At Coastal.com, they were advertising your first pair free! We couldn’t go wrong. 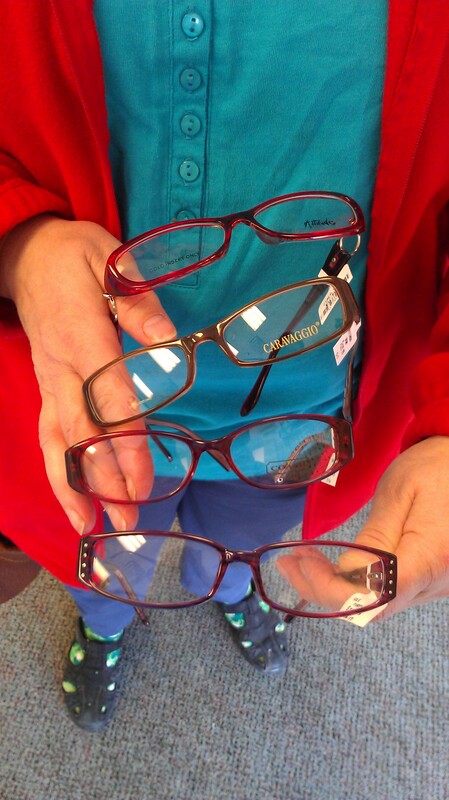 When Rebecca was picking up her contacts she tried on several pair of glasses to see what style she liked. She also took note of the frame size (two little numbers on the arm–one for width of glasses, one for length of arm). She needed her prescription plus the pupillary distance (all exams include this information but not all list it on the prescription, you have to ask for it). As promised, Rebecca’s glasses were free, we only had to pay the shipping and handling charge of $11.58. The glasses arrived as promised within a week and she likes the new style. Our insurance covers a new eye exam and a percentage of the frames and glasses. Because my prescription is complex and because I cannot see without glasses I opted to buy a pair of glasses through the optical store, I go to Nationwide. The reason I go there is because when I got my last pair of glasses someone had recommended I try Wal-mart’s optical center. Surprisingly, they had the exact same frame I chose at the other store; but though they also took my insurance my total cost would have been $50 more. I discovered the cost of all the add-on’s (like anti-glare and scratch coating)– passed on those, picked out a mid range pair of frames, and they tallied up the total. With my insurance my copay was $229.99. Such a deal. But I ordered them anyway. I decided to try a second pair online. The website we used for Rebecca was still offering the same special. BUT. My strength of prescription was an additional cost so the glasses would have been in the $180 price range. That was disappointing and I wasn’t quite sure I wanted to gamble at that price so I checked for other online eyeglass stores. This apparently is like a well kept secret (from me anyway) and I discovered there are like a gazillion stores that offer glasses. The one I settled on was Glassesshop.com. They were offering a 30% off special. I decided to test them with my order. There did not appear to be an extra charge for the prescription strength. And the price included anti-glare and scratch resistant coatings plus a happiness guarantee. My total, with the discount and shipping was $71.80. Pink frames are from Nationwide. Both my new glasses from the neighborhood store and the online shop took about 7 business days. 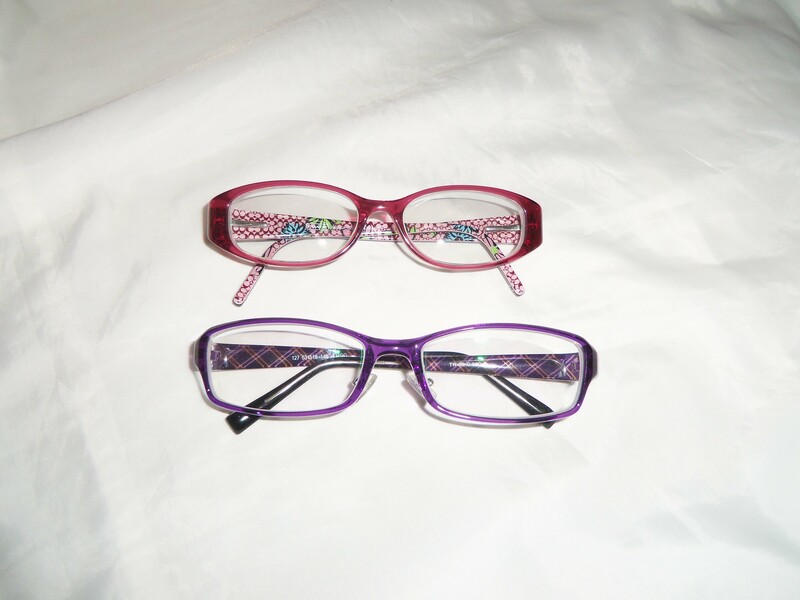 The comparison: I like both pair of glasses. The online pair feel slightly loose on my face and I need to get them adjusted. I don’t know yet if this will be a challenge. I specifically was looking for frames without nose pieces because I’d had so much trouble with the last pair. After looking and looking online and thinking I was choosing carefully I ended up with a nose piece on the online glasses. However, so far they don’t hurt. I also got progressive lenses and was very worried about how they would work with the online glasses, knowing that I could easily go in for adjustments or new lenses if the store bought glasses were uncomfortable. But the bifocal part of these glasses while slightly different is actually more comfortable for me when working on the computer. I am excited for the chance to have glasses that I can change with my mood. I might even order another pair. Of course, my experience is mine alone. You might have a different outcome. But based on this, I would recommend trying an online order, especially if you are looking for a second pair or maybe sunglasses.